For the fifth year in a row, Ulisse was invited to perform in the Nashville Convention Center at the annual CMA Music Fest. 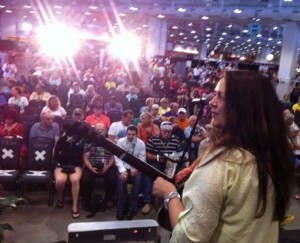 Her performance was on the popular WSM-Durango stage to a great crowd. The performance was also broadcast live on WSM 650-AM and streamed live globally by the station. Her show featured many of the tunes on the “Showin’ My Roots” album. After her performance, her fans waited patiently for a meet and greet, photos and autographs. 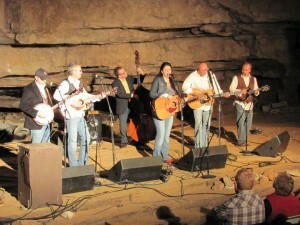 Donna Ulisse & her band The Poor Mountain Boys returned to appear on the show Bluegrass Underground on October 30, 2010 to pick some bluegrass 333 feet under the ground in the Volcano Room at Cumberland Caverns in McMinnville, Tennessee. Also appearing on the show to a very enthusiastic audience was Lonesome River Band. The show will be broadcast on WSM 650-AM on an upcoming evening before the Saturday night Grand Ole Opry show broadcast and has also just signed an agreement to be broadcast on Sirius XM’s Bluegrass Junction channel. Check back for broadcast dates which we will post when we receive them.